Bayview Park is a 35-acre park located in the East Hill Neighborhood and situated on Bayou Texar. Dating to the early 1900’s Bayview Park has been considered a beautiful cornerstone to all parks in the city. The park has gone through many changes over the years and has become a source of pride for the City of Pensacola. There was a time when the citizens of Pensacola went to Bayview Park to relax, swim, listen to music playing from the bandstand, watch movies, dive from the high tower, canoe, dance, meet friends, fall in love, and just about everything else in between. The park was the center of activity in Pensacola during the mid-twentieth century. Today the park still bustles with activity daily and guests can enjoy a large dog park, dog beach, picnic pavilions, a large pavilion, grills, parking, playground equipment, restrooms, swings, tennis courts, fitness court, and walking path/trails. Paddle sport enthusiasts can get out and explore Bayou Texar in a kayak or canoe from the shallow shoreline. If your watercraft is a little bit larger you can head out to enjoy the water and fishing opportunities via the park’s boat ramp. 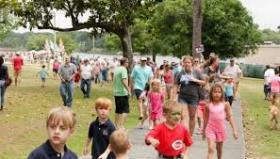 Annual events like the Pensacola Dragon Boat Festival, Earth Day Celebration, and several charitable walks/runs events draw big crowds to Bayview Park for fun and camaraderie. The Bayview Senior Citizens Center is also located within Bayview Park and hosts programs and events for active adults age 50 and better.